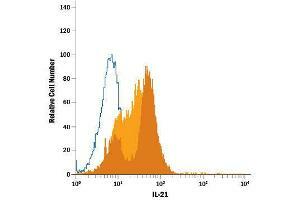 Specificity Detects mouse IL-21 in Western blots. Does not cross-react with recombinant human IL-21, recombinant mouse (rm) IL-15, or rmIL-12. Storage Comment Protect from light. Do not freeze. 12 months from date of receipt,2°C to 8°C as supplied. Carrier, Whitters, Miyashiro, LaBranche, Ramon, Benoit, Ryan, Keegan, Guay, Douhan, Collins, Dunussi-Joannopoulos, Medley: "Enhanced GITR/GITRL interactions augment IL-27 expression and induce IL-10-producing Tr-1 like cells." in: European journal of immunology, Vol. 42, Issue 6, pp. 1393-404, 2012 Method employed by authors: Flow Cytometry (FACS) (Sample species: Mouse (Murine)). Hondowicz, Batheja, Metzgar, Caton, Erikson: "ICOS expression by effector T cells influences the ability of regulatory T cells to inhibit anti-chromatin B cell responses in recipient mice." in: Journal of autoimmunity, Vol. 34, Issue 4, pp. 460-8, 2010 Method employed by authors: Flow Cytometry (FACS) (Sample species: Mouse (Murine)).